Paramount Studios Promo Picture: In 1969 the flamboyant young head of Paramount Pictures, Robert Evans, wanted to show off his new slate of projects and the stars that were in them and talked several of them into posing for this promo picture on the steps of the Paramount Pictures lot. Shown on the top row from the left are Rock Hudson, John Wayne and Yves Montand. Based on the apparent eyepatch, Wayne was obviousy still filming True Grit but was soon to work with Hudson in the post-Civil War film, The Undefeated. At the time the photo was taken, Hudson was working with Julie Andrews on Paramount’s Darling Lili. 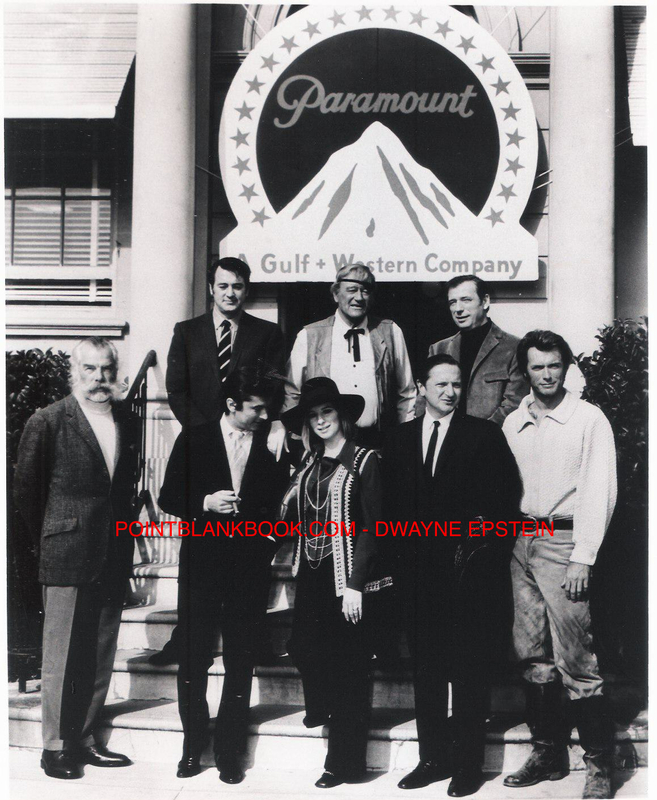 Bottom row from the left are Lee Marvin, Robert Evans, Barbra Streisand, Paramount VP Bernard Donnenfeld and Clint Eastwood. Streisand and Montand were starring in On a Clear Day You Can See Forever. Eastwood was inexplicably still in costume for he and Marvin’s project, Paint Your Wagon. Big budgeted westerns and musicals, or in the case of Paint Your Wagon, a little of both.. Ahh, how the world has changed! Note that in spite of the pretty impressive star power, it is the heavily bearded Marvin who successfully stands apart and alone form the pack. This entry was posted in Blog and tagged Barbra Streisand, Bernard Donnenfeld, Clint Eastwood, John Wayne, Lee Marvin, On A Clear Day You Can See Forever, Paint Your Wagon, Paramount Pictures, Paramount Studios, Robert Evans, Rock Hudson, The Undefeated, True Grit, Yves Montand by Dwayne Epstein. Bookmark the permalink.